6. 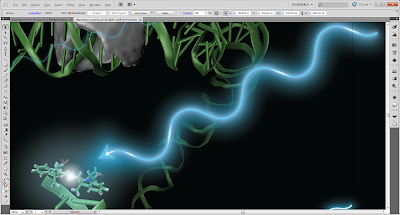 Create glowing waves with arrowheads using Adobe Illustrator - The fluorescence laboratory. 1. In the Layers editbox, create a number of new layers called Waves1, Waves2, Waves3, etc.. Select the bottom layer, Waves1. 2. Hide all other layers but the Background by clicking the eye-icons in the Layers panel. On layer Waves1, create a blue line using the line segment tool. In the stroke panel to the right, set the line weight to 18. 3. Put an arrowhead to the line in the Stroke panel, and set its size to 35%. 4. While the line is selected, go to Effect -> Distort and Transform -> Zig Zag. 5. In the Zig Zag dialog box, set the size to 0.5 cm, 6 ridges per segment and 'Smooth' points. Press OK.
6. Go to Effect -> Blur -> Gaussian Blur and set it to 40 pixels. 7. Copy the arrow, Ctrl+C. 8. Now select layer Waves2 in the Layers panel and press Ctrl+V to insert the arrow into this layer. Position the arrow directly on top of the arrow in the bottom layer, Waves1. 9. Select the new line and go to the Appearance panel. Scroll down and press Gaussian Blur. 10. Set the new Blur to 20 pixels in radius. 11. In the Appearance panel select Stroke and set its new weight to 5 pt. 12. Redo step 8-11 on the upper Wave layers and keep making the arrow thinner and less blurry. The final arrow-wave on the top layer should be whiter, have a Stroke weigth of about 1.2, no Blur and an opacity of 65%. 13. To round off the arrow, we add some glow points along the wave. Select the Glare layer from the Layers panel and copy one of the blended inner dye glares created on the previous page in this tutorial. 14. Select the top layer, here Waves6, and insert the blend by Ctrl+V. Reshape and rotate the blend so that it fits into and along the wave vector.